Fall is in the air - Pumpkin spice lattes. Hooded sweatshirts. Apple Orchards. FOOTBALL. That’s right, this is the time of year that Iowa lives for - Hawkeye football season. Iowans are very proud of Iowa. If you are new to town or just visiting, you may think the unofficial dress code is “Hawkeye apparel.” So, where do you go to get your Hawkeye gear and swag? I really like the selection at Scheels in the Coral Ridge Mall. If you head downtown, Tailgate has some really fun, more vintage looking options and Iowa Hawk Shop is a staple for everyone. If you are going to the game, you should check to see if there is a theme such as “Black Out” where everyone wears Black or “Stripe the Stadium” where each section is assigned a color (Gold or Black). 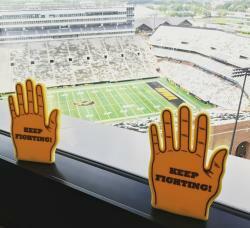 Also, with the new “Wave” tradition to the kids in the Children’s Hospital, think about making it even more special by picking up a foam hand from Beat Cancer. The golf course has always been a key spot for tailgating. It’s right down the road from the stadium on Melrose Avenue and has plenty of parking (for a fee). Note: this will require about a 15 minute walk to the stadium. There are many places to both park and grab a bite to eat on “the strip” - Wig & Pen is a local favorite. A quick walk up the hill to the stadium goes fast as people chant “I...O...W...A”. Parking in these lots require a pass that most people get before the season starts. Unless you know someone with a pass and a spot, tailgating would be hard in these areas. That said, they are the closest to the stadium and have minimal walking. 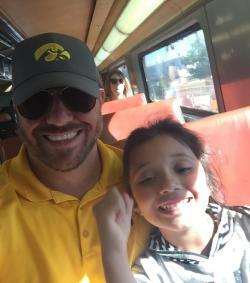 The Hawkeye Express is a themed train that takes passengers from Coralville right to the gates of Kinnick. It’s a great way to avoid some game day traffic, post up in the IHOP parking lot to grill, play some lawn games, and catch a ride with minimal walking. Details for the train ride (cost, location, etc) can be found here. This spot is great for families and kids and has become pretty popular over the last couple of years. You can’t really drive down Melrose on game day, but if you can park somewhere and want to walk around, this is a fun place to head. There are many vendors selling both swag and food. If you keep heading up towards the stadium (by the Nile Kinnick statue) there is plenty of stuff for the kids, a DJ, and other fun activities. New to the scene this year for the public is the Hawkeye Village tailgate experience. Each game has tickets you can purchase which include a ticket to the game, entertainment, all-you-can-eat buffet and drinks. Really, the only thing you need to worry about with this option is where to park and who to go with. If you don’t have tickets to the game and just want to watch with other fans, downtown is a great place to go. Almost every bar will have the game on and many offer specials. Brothers has a lot of TVs and a nice patio. If you are going to be at a car tailgating bring a cooler - drinks, snacks, burgers, etc. Many people will bring flags so it’s easy to show others where they are located. Some people will bring grills, lawn games, chairs, etc. Die hard fans even have dedicated buses or even combines for the tailgate. If you are going to the game, be sure to read up on what’s allowed in the stadium so you don’t have to leave a nice new purse behind. When Iowa scores a touchdown, the marching band tends to default to “In Heaven there is no beer” aka the “Victory Polka” vs. the school song “On Iowa”. I’ve provided links so you can practice singing. :) Iowa tailgating is a tradition that many enjoy. The “Iowa Nice” saying is absolutely true when it comes to tailgating - you’ll find everyone is in a great mood - very generous and genuinely excited to cheer on our Hawks. We’d love to have you join us sometime. GO HAWKS!